Last year we introduced a feature called Task Audit, which lets you see the entire life of a task and have a clear vision of its modification history. Over time, we noticed that the feature was having a steady usage increase, meaning that users have found it useful and were relying on it more and more. Even though its Milestone counterpart even lost a poll against the Crm Custom Fields contender, we decided to bring it to life anyway, so today Milestone Audit is also available for everyone. Clicking the Details link will present the full Milestone modification history, sorted by date. You can see when a Milestone has been shifted, reassigned, or renamed. The development of this feature started a while ago, so we've been tracking milestone modifications for the last 6 months already! You can see recently completed tasks in each Task list by clicking the Recently completed dropdown in the Task list header, but this will only show the tasks completed in the previous 2 weeks! What if you need to see all completed tasks? 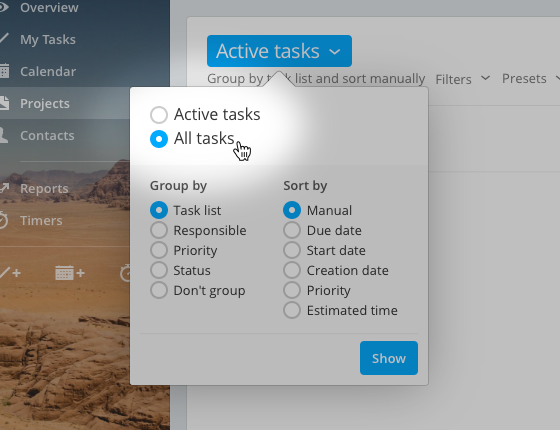 It's very simple: just click on the mode selector and pick All tasks and then click Show. Hidden project task lists are now also hidden on the Gantt Chart. Project Gantt Chart: switching between Active Tasks and All Tasks would restart Apollo when using Microsoft Edge or Safari. Project Gantt Chart: the inbox task list wasn't visible, so tasks couldn't be added to it. Project time: Billable and Not billable time totals were inverted. Some users couldn't see their customized sidebar background image. Some Gantt Chart labels were incorrectly... labelled.